Purpose KRAS mutations are predictive of lack of response to monoclonal antibodies (mAb) against EGFR in metastatic colorectal cancer (mCRC). Most wild-type KRAS patients, however, are also resistant. Retrospective data suggest that EGFR silencing play a role in resistance to therapy. 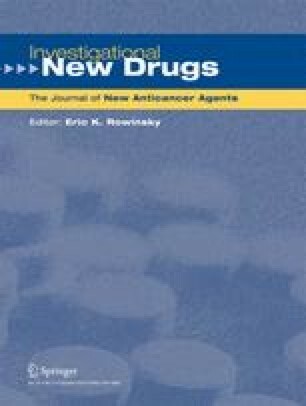 We conducted a study to evaluate the safety and efficacy of decitabine (a hypomethylating agent) in combination with panitumumab (mAb against EGFR) in mCRC patients. Experimental design 20 patients with wild-type KRAS mCRC were included in this phase I/II study. Patients were treated with decitabine at 45 mg/m2 IV over 2 h on day 1 and 15 and panitumumab 6 mg/kg IV over 1 h on day 8 and 22 every 28 days. Blood samples were collected at baseline, day 8, 15 and 22. Quantitative polymerase chain reaction was used to measure promoter-specific methylation in peripheral-blood cells (PBMCs). Results The most common adverse events were grade 1–2 (rash and hypomagnesemia); 3 (16 %) patients had grade III–IV neutropenia including one patient with neutropenic fever. Two of 20 patients (10 %) had a partial response. Both had previously received cetuximab. Ten patients had stable disease (3 of them longer than 16 weeks). Decreased methylation of the MAGE promoter was not evidenced in PBMCs. Conclusions The combination of decitabine and panitumumab was well tolerated and showed activity in wild-type KRAS mCRC patients previously treated with cetuximab. Target modulation in surrogate tissues was not achieved and tumor biopsies were not available. Future studies evaluating hypomethylating agents in combination with EGFR mAb in patients with mCRC are warranted. The online version of this article (doi: https://doi.org/10.1007/s10637-013-9947-6) contains supplementary material, which is available to authorized users. Joan Aaron for scientific editing. Funding was provided by Eisai, Amgen and P30CA042014-23 NCI grant to HCI.